I got to see not just one but two Saint Patrick’s Day parades this weekend: one on Saint Patrick’s Day itself, when I was invited onto the reviewing platform in Askeaton, and the second in Doonbeg, Co Clare, on Sunday afternoon [18 March 2018]. Earlier, following the Sunday services in Saint Mary’s Church, Askeaton, and Saint Brendan’s Church, Tarbert, two of us crossed the Shannon Estuary on the ferry from Tarbert, Co Kerry, to Kilimer, Co Clare, and drove out on to Doonbeg on the west coast of Co Clare. 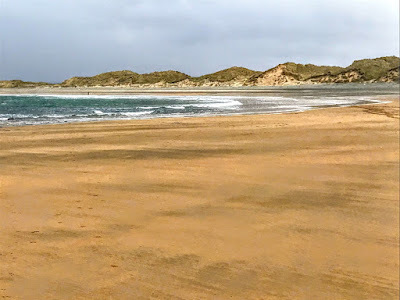 Doonbeg has beautiful beaches and is known for its surfing. But initially, we thought we might look for the Trump Golf resort after the controversial comments made by last week in Washington by the Taoiseach, Leo Varadkar. But we took the wrong turn when we arrived in Doonbeg from Kilrush, and first visited the harbour and Doonmore Castle. The castle was built by Philip Mac Sheeda Nor McCon. The Annals of the Four Masters refer to it as Dun More Mhic an Fhearnachaigh. 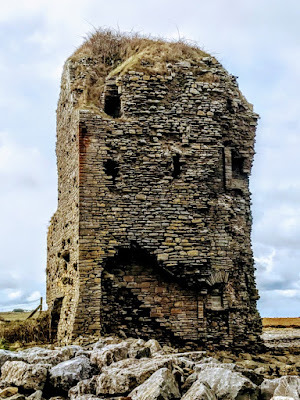 At the end of the 16th century, the castle was in the possession of Donough Mac Dermot Mac an Fhearmachaigh, but Mahon MacGorman held title to one third of the castle and all of Donough’s Land. Sir Daniel O’Brien of Dough owned the castle in 1574. Two decades later, in 1594, Mahon MacGorman assigned his interest in the place to the Earl of Thomond. Murrough MacGucarrick claimed the castle in 1619. Doonmore was confiscated by the crown in 1688 and was sold in 1703. The castle was still inhabited in 1808, but it was in ruins in 1837. A turret at the south-west corner fell around 1898, bringing most of the walls of the upper room with it. The rest of the castle was pulled down soon after, leaving only the lower portion, from the stone vault down, intact. 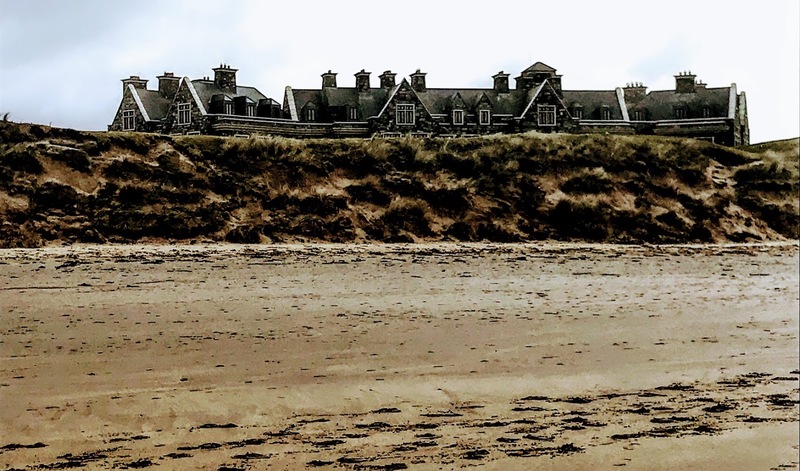 We drove back through Doonbeg to the other side of the bay, then along the banks of the Creegh River, and eventually found ourselves at the Trump International Golf Links and Hotel. 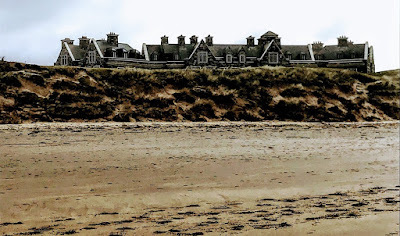 If Trump delivers on his commitment to Leo Varadkar to visit his property in Doonbeg next year, then it was important to know where this is, and to understand all the fuss in recent days. It seeks contradictory in so many ways that a man who denies global warming should seek government funding to protect his golf course from the erosion of the sand dunes on the beach – which is being exacerbated by climate change. 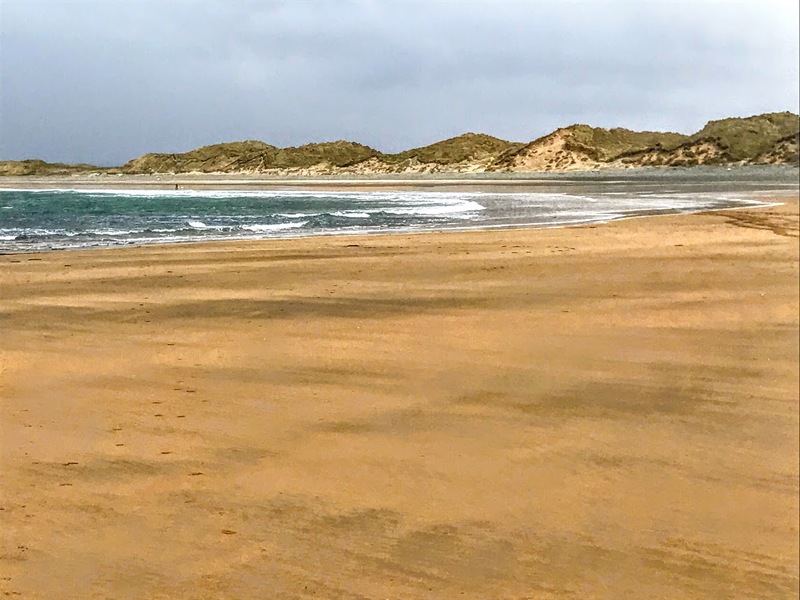 The wind chill made it a bitingly cold afternoon, the waves were high, and although the tide was out and long, white-and-golden sandy beach stretched out before us, we walked for only a short time, and returned to Doonbeg. We were in search of lunch, but nothing could entice me to explore the possibility of lunch in a Trump Hotel … no matter what the food is like, or how enticing the menu might be, nothing could entice me to add to that man’s wealth, no matter how meagre my contribution might be. 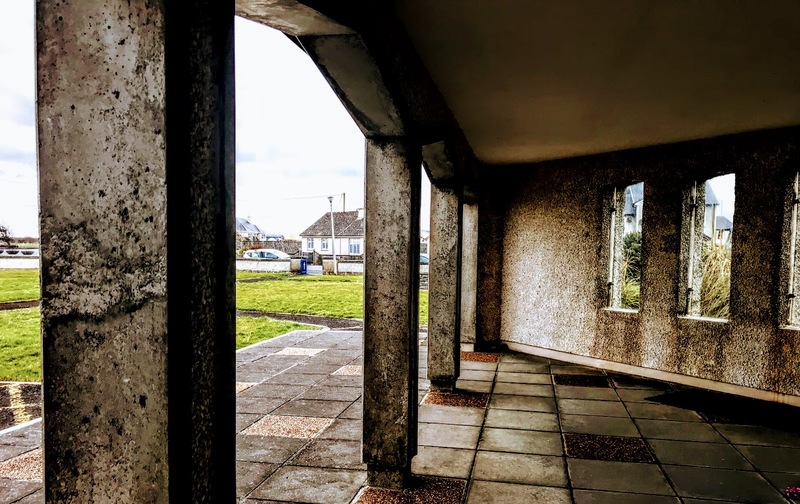 Back in the heart of Doonbeg, a flatbed truck had been converted into a reviewing platform outside Comerford’s Bar, and the Saint Patrick’s Day parade was about to begin … a day after Saint Patrick’s Day. I tried to take advantage of the absence of traffic immediately before the parade to photograph Comerford’s Bar. 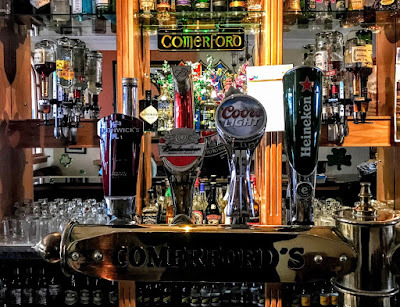 But I was recognised immediately as the author of the Comerford Family History blog, and Tommy Comerford and his daughter Rebecca, who were decorating the platform, invited us into Comerford’s Bar, their family-run pub and a popular music venue. Comerford’s Bar dates from 1848, according to signs in the pub, but it has origins from earlier in the previous decade. The Comerford family of Doonbeg is said to have originated at Clare Cottage, once known as Comerford Lodge, a pre-famine thatched cottage in Spanish Point. In 1839, George Comerford, originally from Spanish Point, married Lucy Burns, whose family owned the pub in Doonbeg. 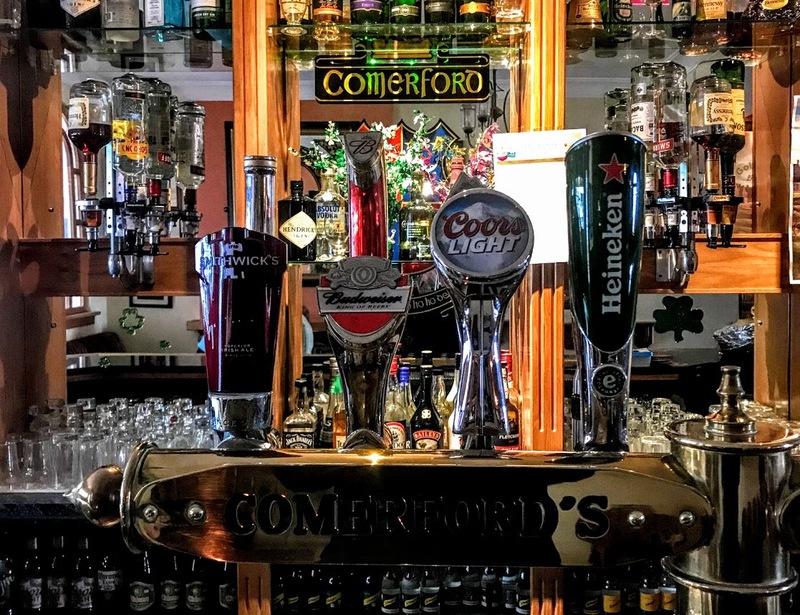 At first, Comerford’s Bar was a single-storey thatched premises selling a variety of household groceries and serving drink at the bar. George and Lucy Comerford were the parents of 11 children, including George, who remained in the family home. 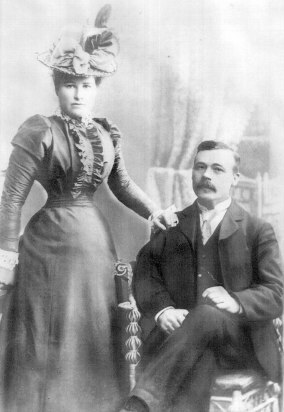 George Comerford and Mary (‘Minnie’) O’Gorman were married on 28 February 1900 and they were the parents of three children, George, Isaac and May. Minnie died on 1 November 1916, aged 52, George died on 3 July 1925, and they are buried in Doobeg. Their eldest son, George Comerford, married Mary Anne (‘Doto’) Kent and they developed an export market for mackerel to France in the 1920s, employing local men and women to clean and prepare the fish for export. The mackerel export business wound up in the 1940s and the family decided to concentrate on farming and the bar trade. Meanwhile, the second son, Isaac Comerford (1902-1983), remained in the Comerford family home and married Teresa Madigan. They had 11 children, of whom eight survived and two of them now run the establishment, Ita and Tommy. Inside, the premises were completely renovated in 2002. It was a busy weekend, and I was introduced to countless other members of the family were working behind the bar and quick to offer a warm welcome. After the parade, our warm welcome in Comerford’s Bar, and lunch in Tubbridy’s, we returned briefly to Comerford’s Bar and then visited the Church of Our Lady Assumed into Heaven. This church was built in 1976, replacing an earlier church built in 1813. It has an uncommon octagonal shape, and its stained-glass windows are designed so that different colours pour down onto the altar throughout the day. We drove back along the coast and the Wild Atlantic Way to Kilkee, and then on to Kilimer to catch the ferry back to Tarbert and to head back to Askeaton.